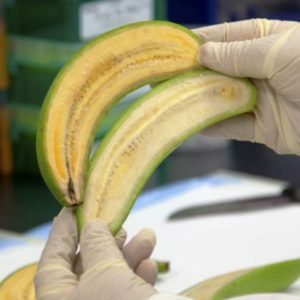 Can we ‘build’ a better banana with genetic engineering? Why does the GMO debate have a bit of Groundhog Day aspect to it? The way the issues are framed is one reason. Too often opponents of genetic engineering are playing a game of Telephone where the meaning and framing of concepts and issues becomes a little more distorted in each retelling. Thus, their conclusions might be sound based on their understanding of the issues, but they commence with misconceptions and misunderstandings from the start. Let’s look at a few of the most common misframings. Genetic engineering is not the same as conventional breeding! Nobody is saying that it is, or at least not anybody credible. No scientist working in the field would say that it is the same thing as conventional breeding. Rather the assertion is that genetic engineering is a form of breeding that falls on a continuum of breeding techniques and is more precise (not perfectly precise) than older, more traditional forms of breeding. Further the assertion is that genetic engineering doesn’t present any significantly different risks than traditional breeding – which isn’t without risk of harmful unintended consequences either. Genetic engineering is not perfectly safe! Nobody is saying that it is, or at least not anybody credible. No scientist working in the field would say that it is perfectly safe. Rather the assertion as already mentioned is that genetic engineering doesn’t present any significantly different risks than traditional breeding – which isn’t without risk of harmful unintended consequences either. There is a corollary misconception that traditional breeding comes with some built-in natural safety mechanisms that stop bad things from happening. There aren’t. Nor does conventional breeding take place over millennia, allowing us to co-evolve with our food. The Honeycrisp apple didn’t slowly evolve over millions or even thousands of years. It was developed over the course of a few short decades. Bold innovations in crop breeding developed with traditional techniques like the Indigo Rose tomato, high in anthocyanins not found in other domesticated tomatoes, or PuraMaize, corn bred to resist cross-pollination from neighboring GE corn for organic growers, took less than twenty years to develop rather than eons. In science, nothing is perfectly safe and safety can’t be proven. Science deals in risk and relative risks can be evaluated. Relatively low risks can be demonstrated. There is no evidence of greater risks associated with genetic engineering nor is there a credible hypothesis as to why they would present greater risk. Why have there been no long term human safety studies? If the safety of GE crops was in doubt it would be unethical to perform such studies . We don’t perform safety studies on humans. We perform them on animals. At least since the shame of the Tuskegee experiments and the Belmont Protocols that followed. 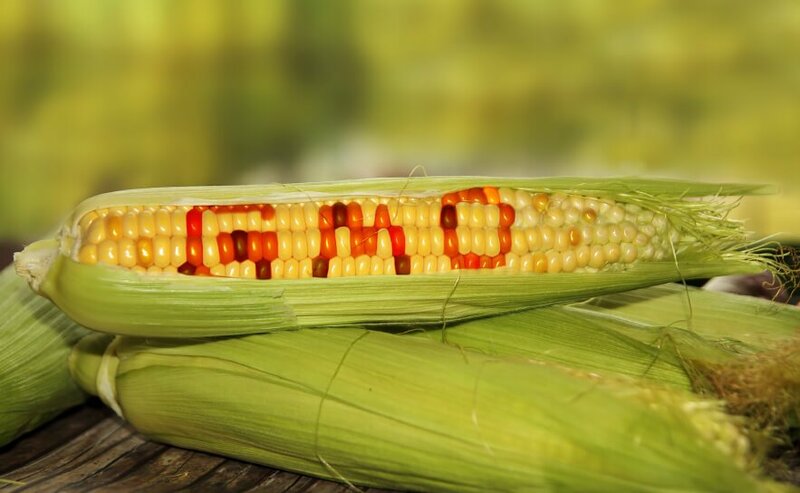 Given their faith that GE crops pose a risk to human health, anti-GMO advocates calling for long term human trials are demanding something ghoulishly unethical. Most likely, they are thinking of drug trials. Those trials are not testing for safety. They are testing for efficacy after risks have been evaluated through animal testing. 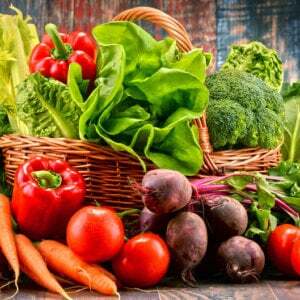 In nutrition, when they do long-term trials they run for up to two years. They don’t test for the effects of single ingredients in long term trials. 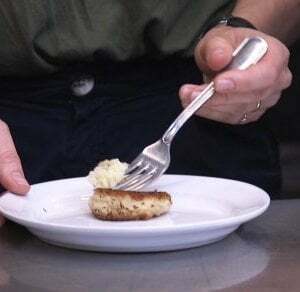 Diets can’t be tightly controlled sufficient to tell us anything useful about the health effects of a single ingredient. You just couldn’t hold all the other ingredients constant to isolate the effects of a single traited crop compared to its non-GE parent. The logistics of a long-term human testing of GE ingredients would be impossible — even if there were a credible hypothesis to test. Nor do we do that for any other novel foods, not the least because it’s impossible. Given that the company previously known as Monsanto was a seed company with a sideline in herbicides, this is putting the cart before the horse. The herbicides are there to boost seed sales. If you go through Monsanto’s annual reports, “Crop Protection” accounts for 15-20 percent of sales for any given year. The vast majority of their revenue comes from seed sales and trait licensing. Many people continue to think of Monsanto as a chemical company. That changed in 1997 when Monsanto reorganized as an agricultural inputs company. The chemical division was spun off as its own company. The herbicide Roundup remained the only chemical product until they added a dicamba formulation a few years ago. A single off-patent herbicide isn’t much a portfolio for a chemical company. Still, it is the case that Monsanto/Bayer is in the business of selling herbicide and Roundup Ready seeds have driven those sales. It just needs to be noted that came at the expense of the sales of other herbicides. Likewise, it should be duly noted that the BT trait for insect resistance has cratered parts of the market for insecticides. 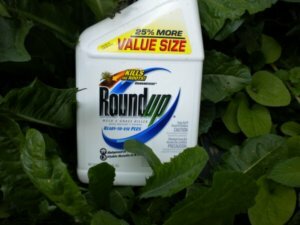 If Roundup is so safe, why don’t you drink a glass? Sure. If you are willing to drink a glass of vinegar, salt, and dish soap. A glass of the common homemade organic weed killer would be two cups of vinegar, two tablespoons of salt, and a teaspoon of dish soap. All of those things are “safe”. I’ll chug if you’ll chug. Or how about this proposition: I’ll drink a glass of Roundup if you’ll drink a cup of coffee with the equivalent amount of active ingredient. Are you willing to drink a cup of coffee with 44 cups worth of caffeine? No? That doesn’t mean caffeine isn’t safe, it just means the acute toxicity is greater than glyphosate. There is a kernel of truth to this one. But it is not the supposed gotcha it is thought to be. Although it cannot be stated that evolution of resistance to glyphosate will not occur, it is remarkable that it has not yet been demonstrated under the broad, repeated use patterns of two decades. … they said that it was a low probability event. They also said that the addition of glyphosate as a tool in new crops could help take pressure off other herbicides that were more prone to resistance. 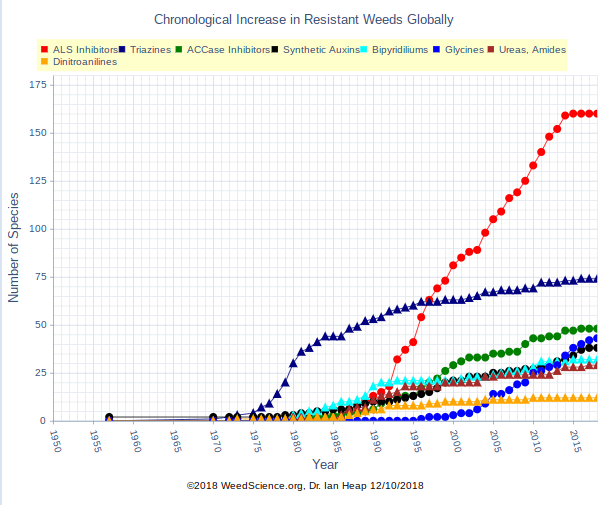 One question that has arisen is whether the probability of the occurrence of herbicide-resistant weeds will increase due to glyphosate use on crops with added glyphosate-resistance genes. This question can be addressed in two ways. First, glyphosate has been used repeatedly in some agronomic systems (e.g., perennial tree crops) for many years with no resistant weeds occurring. 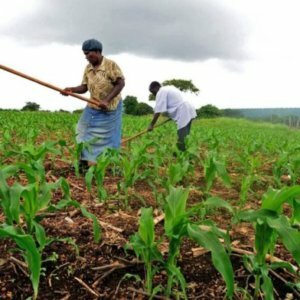 Since the use patterns of glyphosate on crops with glyphosate-resistant genes are limited by amount and frequency of glyphosate applications, it is reasonable to expect that the probability of glyphosate-resistant weeds evolving will not increase significantly over that considered with current use. A second, and perhaps more important point, is that crops with glyphosate-resistant genes will have utility as an effective management tool to reduce the potential for further spread of herbicide resistance among new weed biotypes or in other herbicide families. Both of these assertions have held up pretty well if you aren’t playing gotcha. It remains the case that relative to other herbicides the rate that weeds have developed resistance to glyphosate is low. What has changed is the massive increase in the number of acres it is applied to, substantially increasing the chances of a low probability event actually occuring. 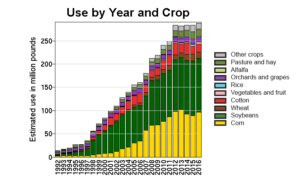 But if you look at glyphosate compared to other herbicides, most of which are used on many fewer acres and less frequently, you can see that resistance is modest given the amount of glyphosate in use. There is also a plausible case to be made that glyphosate has in fact lowered the rate of resistance for other herbicides. 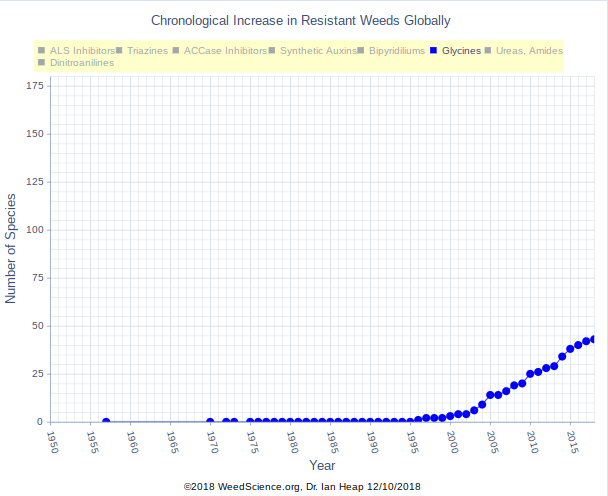 However, you can see that once glyphosate was applied on tens of millions of acres, new species of weeds started developing resistance at a steady arithmetic rate starting in 2003. It was hard to model in 1997 what resistance issues would look like if use went increased over tenfold. Were Bradshaw et al. technically correct in that paper? Yes. Were they overly optimistic in tone and message? Probably. Is the Golden Age of Glyphosate over? Pretty much.